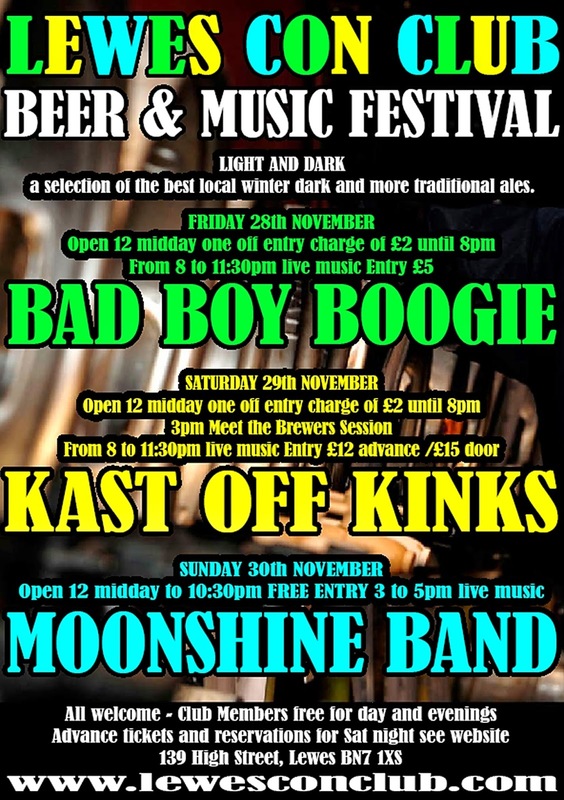 Doors open 12noon Friday 28th November. Saturday Doors open 12noon. 3.00pm meet the brewer session in the bar featuring Matt from Hastings Brewery and Mark from Goldmark. A welcome return by The Kast off Kinks who were put together in 1994 by Mick Avory, the original drummer of The Kinks, and feature long term members of the legendary band. Having played on a regular basis at Kinks Fan Club Meetings and Charity Events, they decided to take the band around the country to have fun and keep the music alive. Sunday Doors open 12noon. 3pm Moonshine band play in the bar. Fiona our new bar manager will be providing a range of home cooked food and snacks. Our pick of some of the best Sussex Light and Dark beers. Something for all tastes - chunky dark beers, a smooth old, our favourite Sussex mild and a range of hoppy and traditional ales. We are pleased to feature two brand new beers from Langham Brewery. Lewes Constitutional Club, known to all as the Con Club, is a private club open daily to members and guests. Situated in the beautiful town of Lewes, county town of East Sussex, only 8 miles out of the city of Brighton and Hove, the Con Club has a large, spacious bar area, a professional music stage, a dining section and gardens. It is also the best live entertainment venue in Lewes!